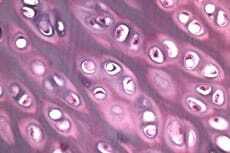 Reported in Science and Translational Medicine, a light-activated hydrogel helps to repair damaged cartilage by acting as a scaffold for stem cells. Jennifer Elisseeff and collaborators modeled the activity of the gel in vitro, demonstrating cartilage tissue development. Following successful application of the hydrogel in a caprine (a goat-antelope) model, the group launched a pilot study to treat patients with cartilage damage to the medial femoral condyle, the lower part of the femur. Patients reported less pain, and imaging studies revealed healthy cartilage.